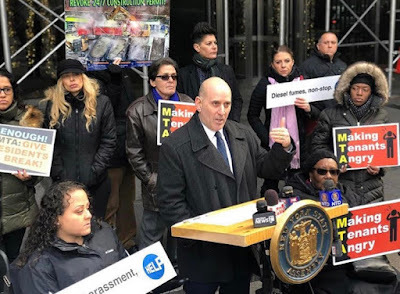 On Tuesday, Assembly Member Harvey Epstein along with residents and advocates rallied outside the MTA HQ on Broadway to call for greater community input to mitigate the ongoing impact of the L-train renovations underway on 14th Street between First Avenue and Avenue A. The work here on this part of 14th Street started in July 2017 ahead of the L-train closure that commences April 27, 2019. This past summer, residents learned that this corridor is not only the main construction zone leading up to the L-train closure, but also during the 15 months the MTA expects the trains to be offline between Bedford Avenue and Eight Avenue. As one 14th Street resident told me about Epstein's press conference: "He got really annoyed with the MTA's intransigence about the ongoing work. Same issues: loud noise, accessibility issues, late hours — going to 24/7 — and general horribleness." 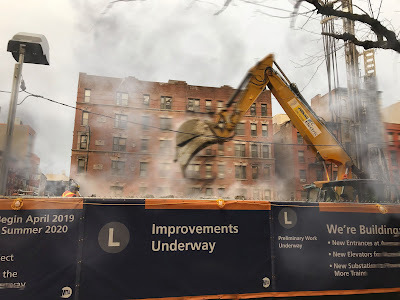 Assembly Member Harvey Epstein advocated with residents and business owners of 14th Street to draw attention to concerns over air quality, noise, and dust mitigation as a result of the L Train renovations. Tenants, business owners, community groups, elected officials, and others gathered to hold the MTA accountable to the repercussions of ongoing construction, which have hurt small businesses and created innumerable nuisances for local tenants. Local residents have raised concerns about the MTA’s limited engagement. Without any input from the community, the L Train construction has created huge impediments on 14th Street. Small businesses are obstructed by sidewalk closures and barriers, and many local owners have reported a decrease in business since construction began. Tenants have been harangued by constant white noise, traffic jams, and dust and debris that have impacted air quality. There’s also been little consideration for accessibility, and sidewalk closures have made it difficult for people with disabilities to access the affected area. The press conference was held to highlight these ongoing issues and bring the stories of 14th Street residents to the forefront. With the support of Assembly Member Epstein, advocates demanded that the MTA take definitive steps to address community concerns, including: holding monthly meetings with 14th Street residents; implementing shorter hours of construction, including prohibiting work on Sundays; instituting an independent monitor for air quality and environmental concerns. “We're calling on the MTA to be a better neighbor to folks on 14th Street” Epstein said. “We're not trying to stop the MTA from doing the necessary work to improve the L train line and the 14th Street and First Avenue, but we do expect the MTA to seek community input in order to minimize the impact of ongoing construction on local residents." Congresswoman Carolyn Maloney and City Councilmember Carlina Rivera also called for more accountability from the MTA. "We have had dozens of meetings with neighbors of the L Project, have developed extensive procedures to minimize the impact of construction, and welcome practical ideas on how we can further protect local quality of life," Tarek said. "We require our contractors to uphold strict guidelines regarding noise, vibration, air quality, and safety, are monitoring all of these impacts, and any suggestion otherwise is just false." 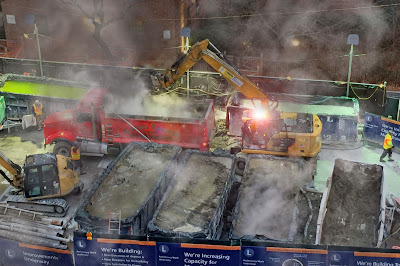 Meanwhile, Gothamist has a piece from Wednesday focusing on the green stuff (upper-left-hand corner in that photo above) that workers are dredging up from the bowels of the L tube. Transit Authority President Andy Byford had pledged to be transparent about what materials workers would dispose of and how. As for the green substance, officials said that it was water, concrete and dirt, per Gothamist. "I don't believe anything the MTA says," resident Penny Pennline said Tuesday. "I'm not buying it, they also said 9/11 was safe for the first responders, where are those people now?" In another development, Gov. Cuomo was scheduled (at the last minute) to tour the Canarsie tube overnight "so that he and his experts can decide if repair work really needs to take 15 months," the Post reported. The tunnel is very old and salt never goes away. It will take 15 months to repair it. Things anyone and the rats living under there already knew.